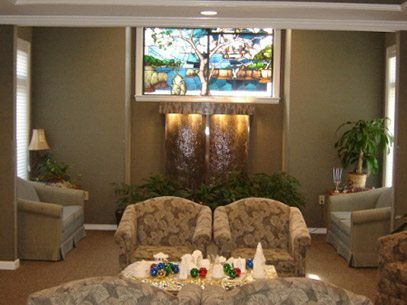 The park-like setting, amidst the trees and flowers, reflects the homey feeling of calm at Hospice House, 1352 Eisenhower Drive, in Savannah, GA.
Our inpatient facility provides extraordinary comfort for the patient and their family. Click here to see a short video. Rooms are warm, spacious and beautiful; care is expert, constant and compassionate. Visitors of all ages can visit loved ones anytime day or night, and may stay overnight. There is ample parking on site for visitors, and WIFI is available. Our Hospice House team works with the patient and their family to fulfill their needs: physical, informational, emotional, social, spiritual, and psychological. Complementary services can also help with music therapy, story keeping, massage therapy, and even pet therapy. Volunteers provide simple conversation, companionship, help with short trips around the grounds, and offer a compassionate “ear” for patient or family members. Family members are encouraged to visit and stay involved with their loved ones; there are no limits on family visits. 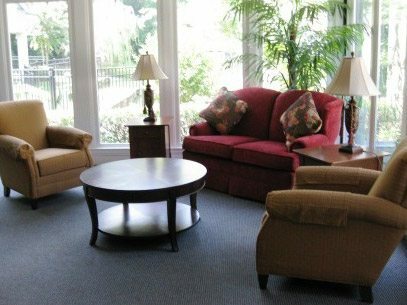 Hospice House is the only inpatient hospice facility in our five county service area and marks Hospice Savannah as one of the premiere hospices in Georgia. It is professionally licensed by the State of Georgia and accredited by the Joint Commission. When patients have difficult-to-mange symptoms like pain, shortness of breath, nausea, vomiting or anxiety, they may need Crisis Care (skilled nursing care in their own home) or General Inpatient Care in Hospice House. By coming to Hospice House these patients can avoid costly hospital admissions yet still have frequent interventions and assessments by our nurses and physicians. However, Medicare only covers short stays (a few days) of Crisis Care or General Inpatient Care and requires a plan to transition your loved one back home or to an extended care facility. Additionally, exhausted caregivers can receive a break of up to five nights by having their loved ones come in for Respite Care. Medicare will pay for respite stays. The dates for these stays will be coordinated between the family and patient, their Homecare Registered Nurse and the Hospice House Charge Nurse or manager. 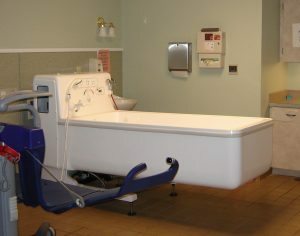 Left: After weeks or months of bed baths, patients enjoy being lowered into relaxing whirlpool tubs at Hospice House.